This topic was recently reviewed by Modayil et al (2014). Biophysics of electrical injuries and the ear/brain. To understand low voltage injuries to the ear, one must understand some biophysics. Morse (2004) analyzed the ways that tissue can be injured by electricity. Human tissue burns occur mainly at the entry and exit points for electricity where the current density is high. The superficial burn is more prominent when the area of entry or exit is small. Tissue burning for a 1 sq cm patch of dry skin, 120-V contact, is estimated to take about 40 seconds. For contact with a power-line at 7200 V, the energy needed to burn is imparted almost instantly. However, it is almost impossible to contact 7200 V outside of work outside on a power transmission line. Neurologic injuries attributed to an electrical injury should include the injured part of the nervous system in the path between entrance and exit. Thus, current that went between - - an arm and a leg - -could not reasonably damage someones brain (Weeks, 1939). Thermal injury occurs only along or near the pathway of the current. As energy = (I**2R)*Time, the current squared term dictates that resistive heating can only take place along the path of current (Morse, 2004). The widely accepted view for analysis of shocks is that the current path is along the shortest linear path, as a "strucureless gel". Bulk tissues, such as muscle, are much lower resistance than nerves and blood vessels, and conducts the overwhelming majority of current. According to Morse, internal heating of tissues is negligable in low-energy electrical contacts. It takes considerable current or contact time to impart enough thermal energy. Low-voltage electrical injuries are < 380 volts, while high-voltage types of electrical exposures are above -- for example, power lines. Low voltage injuries mainly involve "house current", or 120 volts AC. Most low-voltage electrical injuries cause no permanent complications. However, there have been neurologic complications reported (other than burns) include cognitive complaints, sensory complaints, and motor weakness. Grube and others reported their experience with 22 patients who had low-voltage injuries (1990). Of these, 11 had one or more neurologic symptoms. Of these, 9 resolved entirely and two had a residual. Thus, from these data, only about 10% of patients have a residual neurological problem following low-voltage electrical injuries. Peripheral neuropathies were common in patients with high-voltage injuries. In some instances, the peripheral neuropathy was delayed. Mechanisms for peripheral neuropathy are suggested to be due to necrosis or fibrosis of perineural tissue. The most frequent peripheral neuropathies involved the median nerve, followed by ulnar, radial and peroneal nerves (Grube et al, 1990). Transient spinal cord complaints have also been reported, as well as occasional progressive and permanent injuries. Wuesthoff et al (2017) reported on 42 patients with "work related" electrical injuries. They reported "Dizziness was a significant complaint in all workers with electrical injuries. Other common complaints included tinnitus and imbalance. " These symptoms are largely subjective, and might be related to the enhanced reporting of subjective symptoms in individuals who are litigating. In our experience, electricians are the main group of individuals who report symptoms after low-voltage electrical exposures. They often refer to their shock experiences as "electrocution". As the dictionary defines electrocution as "killing by electricity", this word seems inappropriate to us. Case example: A 46 year old male working in the construction industry was "electrocuted" when a scaffold he was standing on fell into live wires. He was exposed to high voltage for 30-45 seconds. As he fell down, a pipe hit him at the base of his head. He stated that his eyes were burned and that he subsequently required laser surgery, and that there were burns on his fingers. When first seen, 2 years post injury, he complained of unsteadiness and positional vertigo. Rotatory chair testing documented reduced responses and increased phase. Legal action was ongoing. According to Cherington, about 75% of patients with lightning strike have a brief loss of consciousness and 80% have brief limb weakness or paresthesias (2003). Many experience a temporary paralysis called 'keraunoparalysis' a term introduced by the French neurologist, Charcot. It is as brief paralysis with loss of sensation that affects lower limbs more than the upper. Strength returns to normal within one or a few hours. When the heart stops, patients may develop a post-arrest ischemic encephalopathy, resembling the state of those who have undergone cardiac resuscitation after a prolonged cardiopulmonary arrest. Intracranial hemorrhages can occur, particularly in the basal ganglia and brainstem. It has been suggested that current may enter the body through the eyes, nose and ears, and travel from the neocortex (cerebral hemispheres) towards the basal ganglia and brainstem. Cerebral infarctions are unusual, and only a few have been reported. Similarly, cerebellar syndromes are unusual, with only about 4 reported in the literature as far as 2003 (Cherington, 2003). The frequency of this lightning injury causing auditory or vestibular symptoms is unclear, but presumably it is small. The most serious injuries from lightning strikes involve cardiac and neurologic systems. In the author's otoneurologic practice, only three patients have been seen with lightning injuries in the last 8 years, out of a total of approximately 5000 patients with dizziness or hearing complaints. According to Jones (1991), the mechanism of injury to the auditory system is conjectural and may vary from case to case. Possible mechanisms may include rupture of the ear, acoustic trauma, flow of electric current through the cochlea, changes in vasculature, and hemorrhage. Cataracts develop in about 6 percent of high voltage injuries and should be suspected whenever electrical injury has occurred around the head. Case example1 : A 30 year old woman presented complaining of tinnitus and dizziness attributed to a lightning bolt. While working at a switchboard six years prior to the clinic visit, lightning struck the building where she was working, causing an electric shock transmitted from her headset. The dizziness gradually worsened over years. Her right ear was explored surgically, but nothing abnormal was found. Symptoms at the time she was seen consisted of dizziness, headaches, tinnitus, fullness, difficulty with hearing, and otalgia. ABR was normal. ENG was abnormal with a nonlocalizing pattern. Audiometry showed mild sensorineural hearing reduction on the right side. A rotatory chair test was normal at high frequencies only. A similar case was reported by Qureshi in 1995. Case example 2: A 13 year old girl was struck by lightning. It left her with poor ambulation and a new bilateral hearing loss. 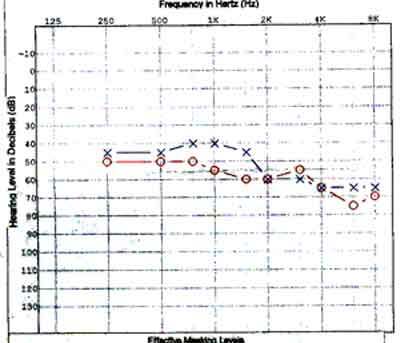 Her audiogram is shown below. There is a moderate bilateral sensorineural earing loss on both sides. There was recruitment bilaterally. Speech discrimination was only fair at loud conversational levels. Tympanometry was normal. ENG testing suggested a central lesion. Qureshi NH. Indirect lightning strike via telephone wire. Injury, Vol 26, #9, 629-630 1995. We are grateful that the parents of the patient in case 2 allowed us to use her audiogram for illustration.